Wireless Adapter Module for projectors with USB type A male and wireless capability. For IEEE802.11 a/b/g/n/ac. Band channels 2.4GHz and 5 GHz. Channel 2.4 GHz; 1 - 11 ch, 5 GHz; 36/40/44/48ch (W52), 149/153/157/161/165ch (W58). Bandwidth 2.4 GHZ; 20/40 MHz, 5 GHZ; 20/40/80MHz. 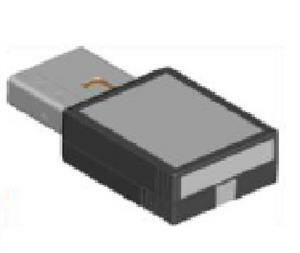 Structure; USB Adapter Type A male.